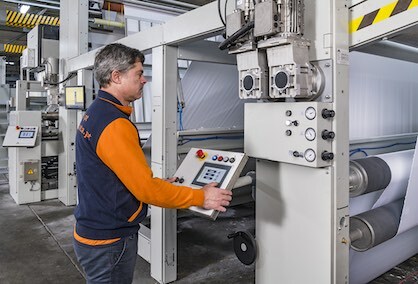 Portugal’s leading commission finisher has recently installed a new Montex stenter – despite some limitations on space for expansion at its Guimeraes plant. In the commission finishing business, finding the time to make necessary new investments in the latest technology can be difficult. Services can’t just stop and orders be delayed when an old machine needs to be dismantled and a new one installed. For Vaz da Costa, which was founded in 1960 on the edge of the historic centre of Guimaraes in Northern Portugal, there’s also the question of space. The town centre of Guimaraes has been listed as a UNESCO World Heritage site since 2001, yet its suburbs have expanded significantly in the past half century and now the Vaz da Costa plant is surrounded by residential buildings, making further outward expansion near-to impossible. Nevertheless, the site is currently dyeing and finishing around 100,000 metres of fabric daily, and has expanded its commissioning services to customers in France, Spain, Belgium and Germany in recent years. These exports now account for around 20% of total commission finishing business. A second business involving the making-up, embroidery and packaging of high-end bed and table linen under the well-known Bovi brand also operates from the site, with a total combined workforce of around 180 people. Around 80% of these products are for export markets. Separate entrance and exit points for the two businesses have recently eased logistics. “We are currently in the middle of what is our biggest ever investment programme, although it’s pretty much an ongoing process,” says Amélia Marques, who joined the company, which was founded by her father, fresh from obtaining her economics degree in the late 1970s. This was at a time when the company was struggling, as Portugal adjusted to democracy in the years following its Carnation Revolution of 1974. “You can imagine, it was not easy for a young woman to be introduced to the management of such a traditional company in Portugal back then, and my father had his own way of doing things, so there was some resistance to my ideas,” she says. Amelia was soon joined by her brother Francisco and her sister Isabel, however, and together the trio have successfully steered Vaz da Costa’s progression ever since. Today, Amelia’s son and daughter are also part of the management team as it moves to third generation family ownership. Vaz da Costa has recently successfully installed and commissioned a new Monforts Montex stenter, having previously opted for a machine from a rival supplier which proved problematic on its installation in 2012, as well as in subsequent day-to-day operation. 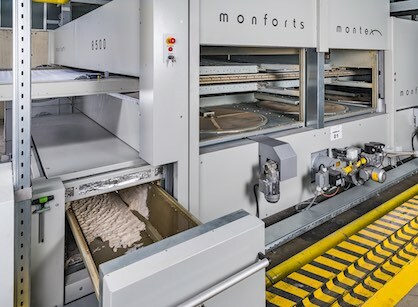 There have been no such problems with the new Monforts eight chamber machine, which has a working width of 3.6 metres and as such is one of the largest in Europe, operating continuously at speeds of above 100 metres a minute. It is equipped with a Mahlo weft straightening unit and a Benninger padder, in addition to a Monforts Ecobooster hear recovery system. The company is primarily finishing 100% cotton fabrics in wide widths, in the weight range of 130-200gsm, with very even conditions required for the squeezing. “Because we are in constant production, the emphasis is increasingly on quality control at the laboratory stage and we now have two fully equipped labs, where personnel has increased from a single person to eight people,” says Mrs Marques. Following the installation of the new Montex stenter, Vaz da Costa is this year planning a further €5 million investment programme which will see a new warehouse building, away from the main site, but closer to the main motorway link. New bleaching and singeing units and a drum dryer are also to be installed and these will be built up at the former warehouse in order to minimise the time required for installation and commissioning.